On Memorial Day, my daughter wanted to have a picnic at the park. It was kind of impromptu, so we stopped by Whole Foods to pick up a few things. One thing we got was this delicious salad with wild rice and kamut. I decided right there that I would have to create my own version. I used wheat berries and black rice instead of kamut and wild rice. It turned out even better that way. This is perfect for summer. 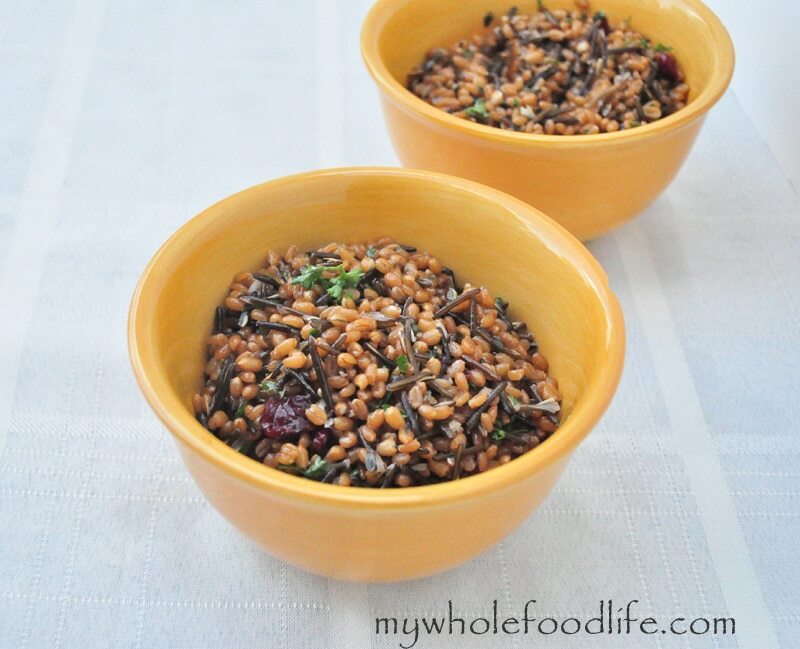 If you have never had wheat berries, they have a nutty flavor that goes perfect with the long grain black rice. This is the kind of meal that will keep you full for quite some time. Since it contains wheat berries and black rice, it could be a complete meal as well. Put the 2 cups of wheat berries and 7 cups of water in a large pot on the stove. Bring to a boil and then turn down, cover and simmer until all the liquid has been absorbed. Cook the rice according to the package instructions. You can even do both of these steps a day ahead if you like. I did that myself. Once the rice and wheat berries are cooled, add in the thyme, parsley, cranberries and salt. In a small bowl, mix the remaining ingredients together to make a dressing. Pour the dressing over the dry ingredients and mix well. This makes at least 4-5 good sized portions. Enjoy! Looks delicious! I will have to pin it so I can save it to make! Thank you! This recipe is a keeper as is the dressing! I made a batch of just the dressing to use on my garden salads. Thank you for sharing! Yay! I love this salad too and that dressing is very versatile. You can even use it as a marinade. I'm making this today and I've never used black rice before so my question is did you rinse your rice after cooking? I usually rinse it before cooking. I get my black rice out of the bulk bins at Whole Foods. You can probably sub out for brown rice if that is what you have. I like black rice because it has a nutty texture and flavor. I wonder how it taste like? It has a nutty flavor. I make a salad that is very similar but add orange, olive oil and lemon juice and omit the vinegar. I then add chopped toasted walnuts. It is a big hit at family parties! Love the texture of wheat berries. Me too! I made a new dish for the blog with farro and the taste/texture is very similar to wheat berries. So good! This was Fantastic!!! The dressing was sweet and tangy and a great compliment to the nutty flavors in the salad. This was also our first experience with wheat berries and we were so thrilled we plan to try farro next! We measured the rice and wheat berries after being cooked but weren't sure if that was correct. I think we would have gotten a ton more if we measured everything dry. Thank you again for all of your wonderful recipes!! Loved this recipe, thank you Melissa! I just Googled "black rice" as I randomly bought some at Trader Joe's. I know it is also known as forbidden rice and had healthy rumors so I snagged it. Low and behold I also had wheat berries that I have used once and forgotten. I actually made this twice and the second time I added the diced orange after the juicing and it was nice. Also, I added a couple of grinds of dried Tabasco peppers from my garden. Lovely! Hi, just to let you know, you have used WILD RICE in that recipe, not BLACK RICE, which is short grained and shiny. I did use black rice. It was a long grain black rice.